I posted this buckle a while back, so here it is again with the update. This was a custom piece through Etsy for a designer of clothing. Here is a shot of the coat from the back. 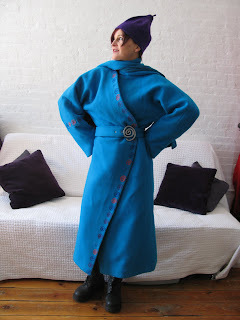 The buckle was to match this spiral design and was used on the belt for this coat. A special thanks to Sol Azul for letting me make this buckle for this coat. Thanks much for promoting my designs, Jake - I am very happy with your buckle!